EMMITSBURG, Md. – At the 35th annual National Fallen Firefighters Memorial Service, the names of 24 FDNY firefighters whose deaths were linked to cancer from Ground Zero were added to the memorial this weekend. They were among the 112 honored during the service on the grounds of the National Fire Academy in Emmitsburg, Maryland. 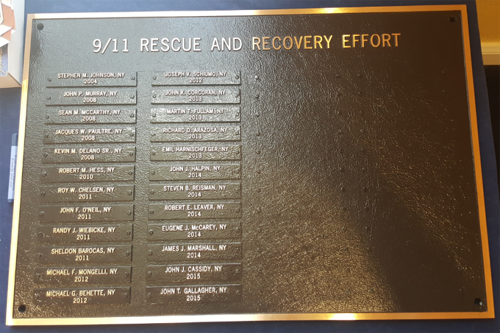 This was the first time that the National Fallen Firefighters Foundation was able to add the names of firefighters who died of cancer from their work during and after the Sept. 11 terror attacks to the memorial due to a determination about the deaths from the National Institute for Occupational Safety and Health. NFFF Executive Director Ron Siarnicki reported that research done by NIOSH Dr. John Howard was able to make a clear identification of causation regarding a firefighter’s work during the attacks and during recovery efforts to the cancers caused by toxins in the rubble and dust. The process used by NIOSH can now help in the determination and documentation of a firefighter’s death allowing for the family to possibly be eligible for assistance from Public Safety Officer Benefits. The announcement from NIOSH increased the number of fallen firefighters being honored in this years’ service. Prior to the NIOSH information, the NFFF had planned to recognize a total of 88 fallen firefighters from 2015 and previous years.